I didn't know what to expect when I started this book. I'd read numerous raving reviews of it when it was released last December, but I'd forgotten what they said. I figured it would be a light, fluffy, funny romance. But it was not. 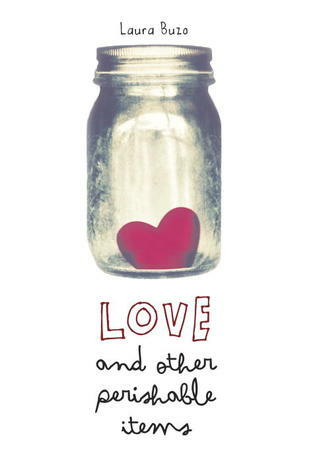 Love and Other Perishable Items is a subtle novel about friendship, love, family, and growing up. In one moment, the story can be hilariously witty and in the next poignant and bittersweet. Laura Buzo is Australian and the book is set in Sydney, which I hadn't realized going in. Her writing reminds me of her fellow Australian Melina Marchetta with a slightly lighter touch. The book is told through both Amelia and Chris's eyes, which is wonderful because we see two very different viewpoints of each character. In Amelia's story, she is unsure of herself in every sense - where she stands amongst her friends, her family dynamics, how she comes off to other people. Chris is funny, outgoing, goofy, charming, mature and perfect in nearly every way other than his ongoing crush on Kathy, their co-worker. When the viewpoint switches to Chris, he views himself as stuck at a point where he's no longer a kid and not yet an adult and he's not sure how to transition. Plus, he's devastated over the loss of his two-timing ex-girlfriend. Amelia is like a breath of fresh air. She doesn't put on airs, she's passionate about everything she's learning in school. It's blatantly obvious to Chris that she's on the verge of becoming an amazing person. He is as attracted to Amelia as she is to him, even if he doesn't admit that to himself for a long time. I've read numerous books where a teenage girls falls in love with an older guy and they begin an illicit relationship which invariably ends badly. This is not that book. It is a love story that is not yet a love story. It is the opposite of insta-love. Their chemistry and attraction grows as they get to know one another on a level far deeper than most teenage love stories. They delve into the dark secrets of their families, their likes and dislikes, philosophy, their own mistakes. The book is painful to read, because they are perfect for each other but the gap is too large. If you're sick of reading YA romances that leave you feeling like you need to brush your teeth, you'll love Love and Other Perishable Items. The book is painfully read. People are not perfect, circumstances are not perfect, time is not perfect. Yet despite the feeling of impossibility, you'll be left with a deep sense of satisfaction and happiness. Fabulous review! I enjoyed reading your thoughts on it, sounds a good book. Thanks for the recommendation. LOL -- "sick of reading YA romances that leave you feeling like you need to brush your teeth". I do love the sweet romances but too much of a good thing will give us cavities, for sure. Haven't read this one but I've heard good things about it! I loved this book for all the reasons that you mentioned. This book is a perfect example that a romance type of novel can be smart and deep. So glad you enjoyed it! I have been wanting to pick up this book, but I decided to wait until it came out in paperback. I already have it on order. I did download a sample and I really liked it, but the sample was too short and I want to read more of the story. I love the sound of this one Alison, but of course you know me, I want that happy ending where the couple is happy and together and all that. Obviously, that's not going to be the case here (which is a good thing given her age), but that's why I haven't picked it up yet. I do love that it's a love story that's not a love story though, I just need to be in the right mood for it. So glad you were a fan it's definitely one I want to try! I love coming of age stories. They are always so nice to discover and be a apart of. Nice review. I loved this book! I adored Chris and Amelia. They were perfect for each other. Darn that pesky age gap. Those Australian authors sure do know how to write a good story. This one caught my attention when it was released in Australia, and I was so happy when it was released and my library got a copy. It's really worth reading. I loved this book so much-very well-written despite my apprehensions that it would devolve into some gross young girl/older man love story. Very glad ti was published in the US!